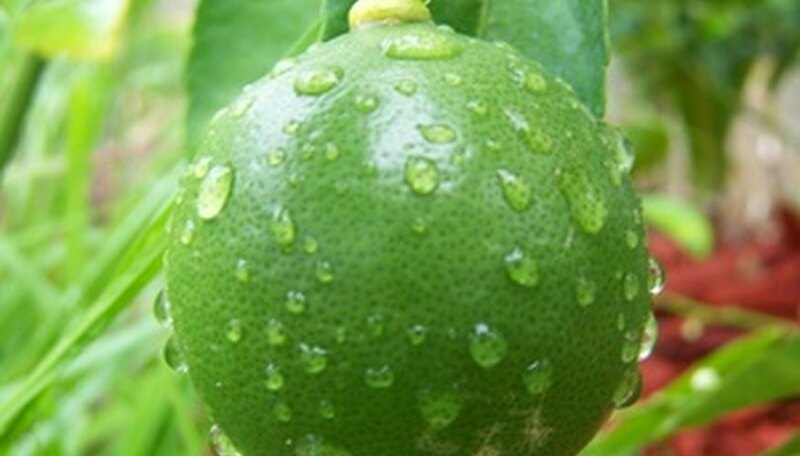 Limes are small, oval citrus fruit with porous smooth skin. Their color ranges from light to medium green, sometimes with a yellow cast. Lime trees grow to a height of 15 to 20 feet, are evergreen and have thorns. The leaves are green and oblong shaped. The flowers that appear before fruiting are white and very fragrant. Honey made from lime flowers is used as a household remedy for indigestion. Fertilize lime trees in their first summer when 6 to 8 inches of growth has occurred. Two lbs. of compost applied per month until leaf fall is recommended by the University of California Home Orchard website. It can be scattered in a circle around the tree 1 foot from the trunk. Fertilizing with compost is doubled in the second year of growth and reduced slightly thereafter. Lime trees need 17 nutrients to thrive and produce fruit. Carbon, hydrogen and oxygen are obtained from air and water; the remaining mineral nutrients must be absorbed from soil. Necessary minerals include nitrogen, phosphorus, potassium, calcium, magnesium, iron and zinc. Nutrients needed in small amounts are sometimes referred to as trace minerals. Nitrogen is used in the largest amount by lime trees and all vegetation and must be continuously supplied. It is made available by microbes in soil, created by their ingestion of organic matter. “Nitrogen affects the absorption and distribution of practically all other elements and appears to be particularly important to the tree during flowering and fruit set,” according to a University of Florida Extension report on fertilizing citrus trees. Citrus fertilizers concentrate on supplying much-needed nitrogen, phosphorus and potassium (N-P-K ratio) to boost tree growth and fruit production. Without a continuous supply of nitrogen, lime trees are undersized and have erratic fruit bearing patterns. Severe nitrogen deficiency causes yellowing leaves that begin in older leaves and proceeds to younger leaves. Nitrogen is one of the 17 nutrients available in natural fertilizer. Synthetic fertilizer is absorbed directly by lime tree roots but does not enhance the biological activity of the surrounding soil. Nitrogen and the other essential nutrients are made available to plant roots through soil biological activity, which is renewed and sustained by adding compost or organic fertilizer. Chemical nitrogen singled out as a fertilizer unbalances natural soil processes. What Nutrients Do Meyer Lemon Trees Need to Bear Lemons?